The Bilby Tower was designed in 1926 by Jasper S. Bilby, Chief Signalman for the U.S. Coast and Geodetic Survey (C&GS). The Bilby Tower was made of steel and included many unique features that made this one of the most widely used towers. C&GS built its last Bilby Tower in 1984, over 50 years after Jasper Bilby conceived of its design. Left: Building a Bilby Tower. Right: A completed tower. The Bilby Tower was designed by Jasper S. Bilby, Chief Signalman for the U.S. Coast and Geodetic Survey (C&GS) from 1884 to 1937. In 1926, based on his familiarity with wooden survey towers, steel pipe towers used by the U.S. Lake Survey, and popular steel windmill towers of the day, and probably his having seen toy Erector sets, Bilby designed a portable, reusable, galvanized steel survey tower. At that time, the wood for towers was becoming very expensive and the time to build a tower from scratch for each survey was costly in man-power. In fact, in the much flatter eastern portion of the U.S., the type of surveys was changed from triangulation to the less accurate traverse type of survey to avoid having to build expensive wooden towers. Bilby designed his tower to be reusable, so even though the tower cost more initially to construct, over time it saved money in both acquisition costs and in labor. The Bilby Tower was basically a giant Erector set. It was designed to strict specifications drafted by Bilby with help from the Aeromotor Company, builders of windmill towers. Two-and-a-half ton trucks used to transport Bilby Towers. After several trials, the Bilby Tower was found to meet all requirements specified by Bilby. 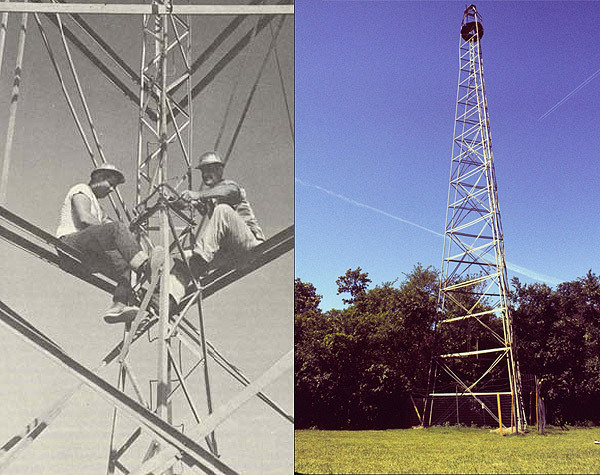 C&GS used Bilby Towers for over 50 years, allowing the more accurate triangulation surveys to again be conducted in the eastern U.S. Other organizations that used the Bilby Tower included the U.S. Army Corps of Engineers, the Inter-American Geodetic Survey (in Central and South America), the Geodetic Survey of Canada, the Ordnance Survey (U.K.), and surveyors in the United Kingdom and France (for a cross-English Channel connection). Standard heights: 24, 37, 50, 64, 77, 90, 103, 116, and 129 feet (plus 10-foot extensions). Note, the heights given represent the inner tower (instrument) height; the outer tower was 10 feet taller. The tallest Bilby Tower was 159 feet. Unique features: Essentially a giant Erector set, could be readily put up by five men in one day without a crane, used for observations, taken down by five men in half a day, transported via truck, and reused over and over.